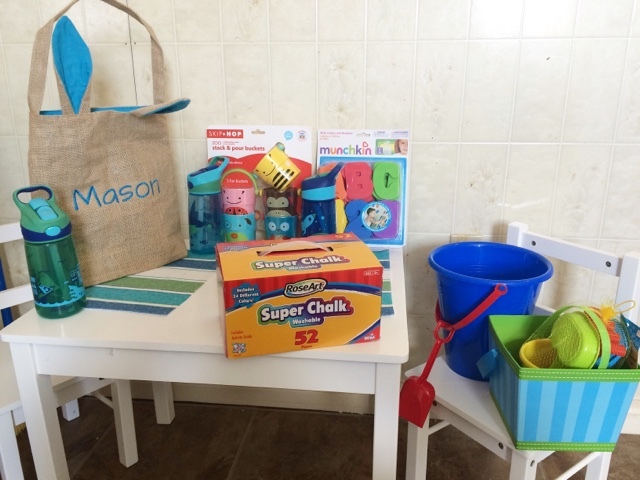 Easter gift ideas for toddlers- Attempting quality over quantity. It's officially Spring, and although Mother Nature is seriously confused I can't help but get excited. I want to fill my house with plants and flowers this year and spring clean everything, but first we need to celebrate Easter! It seems like every year someone comments about how Easter is turning into a second Christmas. Because of social media, we are now able to get a glimpse into each others lives like never before, and it seems like not everyone likes what they see. I personally feel that every family should celebrate each holiday however they want. If you want to buy your kids a ton of presents, do it. If you want to have an Easter egg hunt and a few little gifts in a basket, do it. - Cheap toys that will break within a few uses. - Kitchsy items like funny sunglasses, bubbles that only last a couple of uses, an Easter egg shaped notepad, etc. - A TON of chocolate eggs. When I was a kid, we used to find chocolate eggs MONTHS after Easter in hiding spots that mom forgot about. At Mason's age he might be getting 1 or 2 chocolate items, but for older kids, if you want to give candy, I suggest giving a few of their favorite kinds instead of generic chocolate eggs that will probably just get lost in the couch cushions anyway. - Holiday themed stuffed animals (sorry mom!). I think these are really cute for babies, but you don't need to give kids Easter themed stuffed animals every year. If your child really loves it and will play with it all the time, then go for it, but my child does not. Mason doesn't even really like stuffed animals (or "stuffies"...hate that term). We have a basket in his room with the ones that he has gotten, and he never plays with them. He might cuddle one for a few minutes if I hand it to him, but then it gets tossed aside. Most of the ones he does own are bunnies and chicks from the last 2 Easters. I struggle with what to do, because he doesn't play with them but they kind of have sentimental value because they were given to him by family. I do not want to end up as one of those old ladies who lines her couch with her kids old Holiday bears (or bunnies) each year. So what does quality over quantity mean? I think it can mean different things for different families. For some it may mean spending more money, shopping at certain stores, or simply buying wooden toys over plastic. For me, quality over quantity means spending money on items that will last a long time. You don't necessarily have to spend more money to get quality depending on what you buy. - Munchkin foam bath letters. These are a dollar store purchase. I googled them while I was standing in the store, and they were a steal for $3. - His Easter bag! I'm pretty excited about this one. I had looked at different baskets at a few stores but couldn't find anything that I loved. I bought this from a local work-at-home mom for $25. The price was comparable to ones on Etsy except I didn't have to pay shipping since she's local. - He is also getting plastic eggs full of Hot Wheels this year from my mom instead of chocolate. My dad is getting him a new Spring outfit, and Mitch's mom got him an awesome new Tonka truck. A new bike. We bought Mason a balance bike, which I will talk more about in my birthday blog post. Summer stuff is a good idea because you were probably going to purchase it anyway, so you might as well make it an Easter gift.